Dollhouse Decorating! 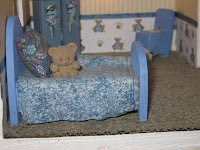 : Make your own wooden dollhouse bed! 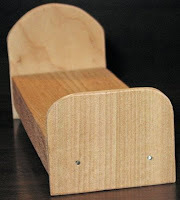 Make your own wooden dollhouse bed! First, decide on the size of your bed... for a 1 foot = 1 inch scale you'll want the bed mattress part to measure approximately 3" by 6". Cut a 3/4" deep block of wood to these dimensions. Then, out of thinner wood, cut your desired headboard / foot board shape. Nail (or glue, but nailing is more sturdy) the bed together, leaving a small space under the bed to make it look more realistic. Next, paint or stain the headboard and foot board. Now, choose the fabric for your bed mattress as well as the bed-covers. Here, you have several options. 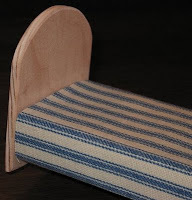 If you will have children playing with your house, I highly recommend sewing or gluing the bed-covers onto the bottom middle of the fabric for your mattress. If you will not have children playing with it, then just leave the bed covers loose. 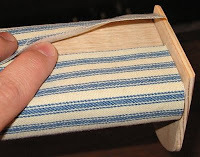 Spread the wooden bed mattress with a thin layer of tacky glue and "wrap" it with your mattress fabric. 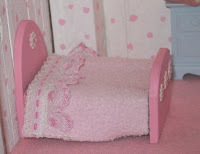 This pink dollhouse child's bed uses fleece for its bedspread. Fleece works great because it does not ravel. It is trimmed with a scrap of lace. The headboard and foot board was embellished with small flowers, cut out of a string of "ribbon flowers". This blue bed shows you a very quick and easy cover - just a scrap of cloth cut out and fray-checked around the edges. 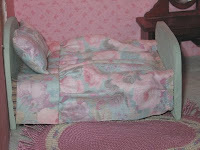 Now, this bedspread is my favorite, because it looks the most "real" with all the tucks! It is part of the sleeve of an old child's dress. It was already hemmed like that... I just cut it and fray-checked the cut edges. I also cut the tie off the back of the dress and stuffed part of it and sewed up one end and a stitch through the middle to make a double pillow for the bed. Even if you're a non-seamstress (like me!) you should be able to run a short straight stitch in two places or find someone who can do it for you. You also might be able to make pillows using fabric glue, but I haven't tried it, so not sure about that one... let me know if you try it, how it goes! This is really cool! im so gonna do this! So simple. I love it. Thanks for sharing! where do you find the small pieces of wood for something like this? The particular wood shown at the top of this post is oak remnants from a furniture factory. Sometimes Home Depot, Lowes, or any hardware store that sells lumber will have small pieces left that they are willing to give you for free (or almost free). Scrap trim pieces at "Habitat for Humanity" type places also work well. Oak is not the easiest wood to work with when you're building small pieces of furniture, it's simply what we were given, so we used it. Oak is a hard wood and soft woods (like pine) are easier to hammer and sand. One more comment! If my memory serves me correctly, the bed "mattress" part was simply a chunked up 1x6.